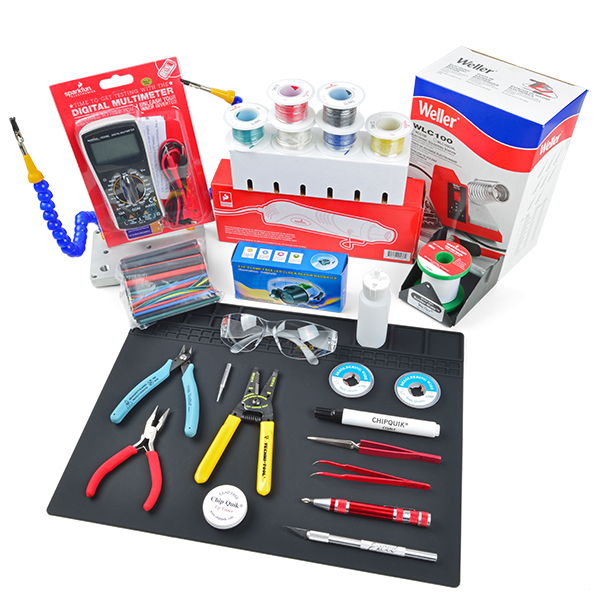 This is Sparkfun’s new Deluxe Tool Kit! We’ve picked our very best tools and put together the ultimate kit of items we use on a daily basis. Whether you’re a beginner looking to get into some serious hardware hacking, or just setting up a second workshop and need the complete kit, this has everything you need! This latest edition of our deluxe tool kit adds several items, most notably the heaterizer, a third-hand kit, more hook-up wires, and our upgraded wire strippers and flush cutters! Note: Sorry international folks, the SparkFun Deluxe Tool Kit only includes instruments with US power plug and voltage operation requirements. At a added price, can the WE1010 be swapped for the WLC100 in the kit? Sorry, we don't have the ability to swap out parts in a kit. I believe everything except the water bottle is available to purchase separately though. The WLC100 in the current kit seems like a step backwards. It's a variable power iron but does not have closed loop temperature control, the feature that really takes soldering to the next level. I did consider using the WE1010 that we carry, but I wanted to keep the price on the kit affordable (and it is still over $200). The WLC is still a pretty good iron for people getting started, and if you aren't just getting started you probably have enough stuff that the kit isn't cost effective for you anyway. In other words it was a matter of trying to find a balance which is always tricky.